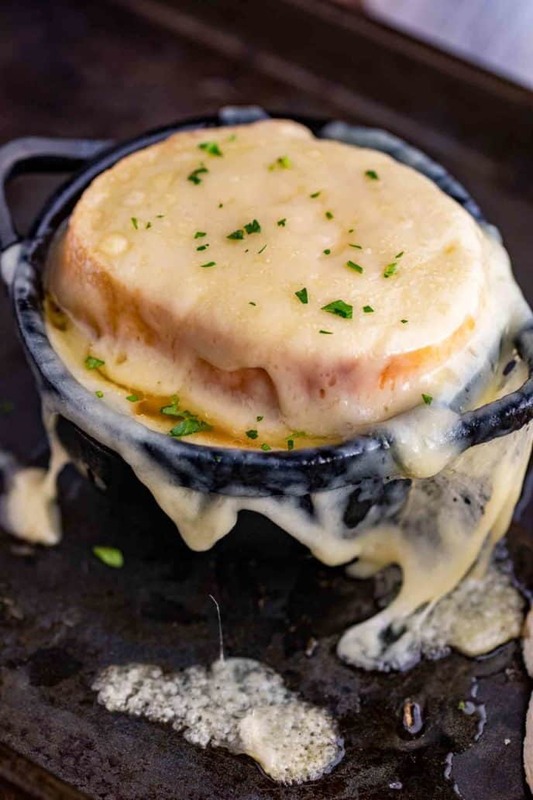 French Onion Soup is a hearty classic soup recipe made from onions, beef broth, dry sherry, and seasonings, topped with toasted french bread and melted Gruyere cheese. 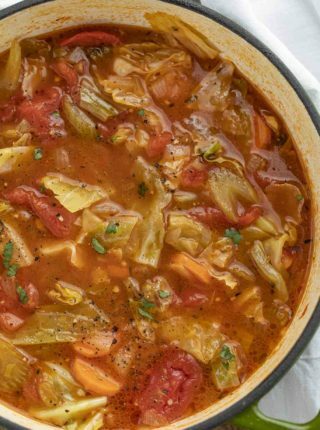 We’re in a classic soup frame of mind this winter, and today we’re serving our Cabbage Soup, Ultimate Slow Cooker Pot Roast and an easy Vegetable Soup! 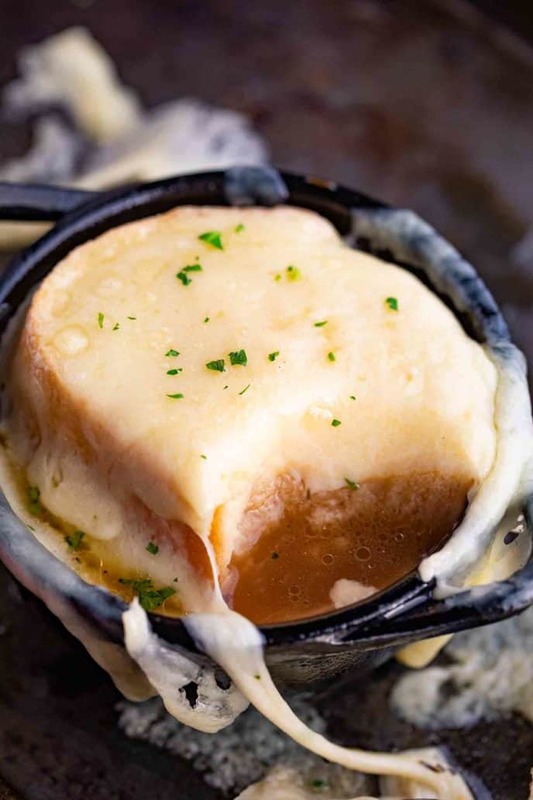 French Onion Soup is the PERFECT combo of sweet caramelized onions in a savory broth, topped with crunchy toasted french bread and gooey broiled cheese. You can melt the cheese in a toaster oven, or on a baking sheet under the broiler in the regular oven, if your soup bowls are oven-proof. I don’t know anyone who can pass up this onion soup, especially when it’s just out of the oven and the broiled cheese is bubbling and gooey. There’s a lot of really nice flavor going on here, so I like to serve this soup with a something simple like a wedge salad or extra garlic bread. HOW LONG DOES HOMEMADE FRENCH ONION SOUP LAST? Homemade french onion soup will last tightly sealed and refrigerated for 3-4 days. Wait to add the bread and cheese until you’re ready to serve. CAN YOU FREEZE FRENCH ONION SOUP? This french onion soup recipe is perfect to make ahead and freeze. It will keep in the freezer for about 3 months. Remember that this onion soup is heavy on the broth side, so it might take longer to defrost in the refrigerator. I would take it out the day before you’re going to eat it. I also don’t recommend freezing with the bread and cheese, or the bread will get soggy. Completely defrost the soup, then warm in a saucepan. Then pour into a soup bowl, add the bread and cheese, and broil in oven-safe bowls as usual. 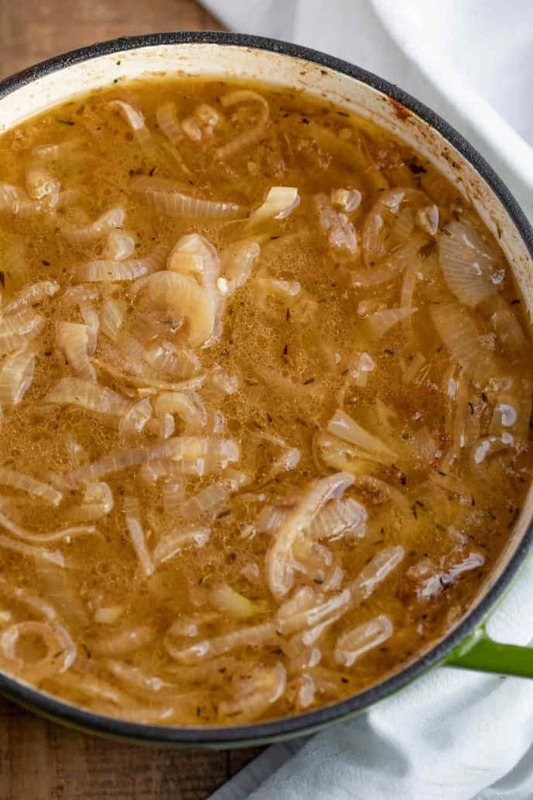 WHAT ONIONS SHOULD YOU USE FOR FRENCH ONION SOUP? 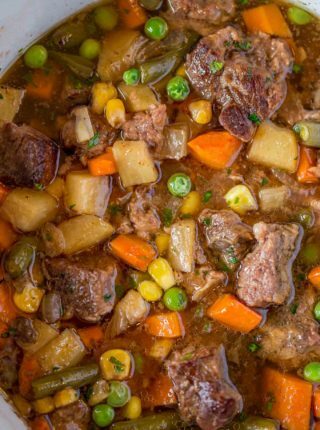 This recipe calls for a sweeter variety of onion, because the sweetness plays off of the savory flavors in the beef broth and wine. Plus they only get sweeter when you caramelize them. I like to go with yellow onions because they’re easy to find and cost-effective. You can also use Vidalia onions if you have them, which are slightly sweeter and more mellow. 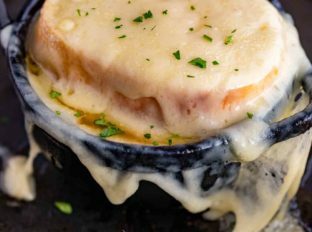 WHAT TYPE OF CHEESE IS ON FRENCH ONION SOUP? Traditionally, french onion soup is topped with Gruyere. I’ve also made this using aged provolone, which is still melty like Gruyere and has a nice sharp flavor that compliments the onions well. Plus it gets gooey and slightly crispy on top when you broil it. WHAT KIND OF WINE CAN YOU USE FOR FRENCH ONION SOUP? Traditionally the recipe calls for dry sherry, which is a type of wine that’s fortified with brandy. If you’re not a fan of sherry, you can use any dry wine. Because the onions are sweet, I would recommend something like cabernet sauvignon, or similar. You can also use straight brandy. 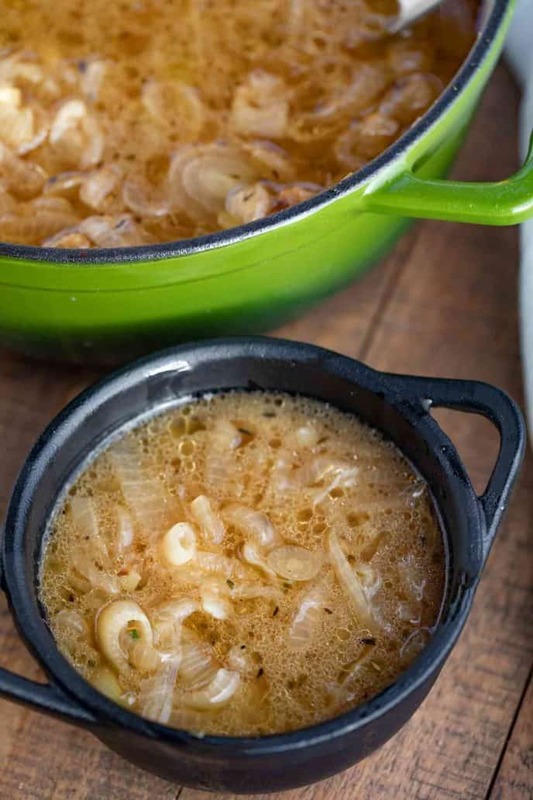 You can make this french onion soup recipe with or without wine, but the wine adds another depth of flavor that works really well with the onion and broth base. Make this vegetarian by using vegetable broth and a vegetarian-friendly Worcestershire sauce (traditionally the sauce contains fish). Make sure you don’t crowd the onions while they’re caramelizing. Choose a pot that has enough room to comfortably fit the onions without making a mountain of them. Instead of slicing, you can cut the french bread or baguette into large cubes and toast them on a baking sheet to make it more of a bite-sized crouton. You can use chicken broth in a pinch if that’s all you have, and deglaze the pan with white wine. Keep in mind that this will change the overall flavor of the dish. Make this reduced sodium by omitting the salt and using a low sodium broth base. If you can’y find sherry, you can use your favorite red wine. This recipe can be kid friendly if your kids like onions, but I would leave the sherry out when making it for them. Add a tablespoon of brown sugar for an even sweeter flavor with slightly molasses notes. You can also add a tablespoon of all-purpose flour to the onions while they caramelize if you want to thicken the broth slightly, or a bay leaf for even more flavor. Top with fresh flat-leaf parsley or thyme for presentation right before serving. Add the butter to a large stock pot on medium heat with the onions and stir and cook until the onions are see through but not at all browned, about 30-35 minutes. Add the broth, Worcestershire sauce, sherry, thyme, salt and pepper and bring to a boil, then reduce to a simmer for 30 minutes. While the soup is simmering toast the French bread slices, and when ready ladle the soup into a soup bowl, top with french bread, then Gruyere cheese and place into a toaster oven or 375 degree oven for 10-12 minutes or until the cheese is melted and browned. 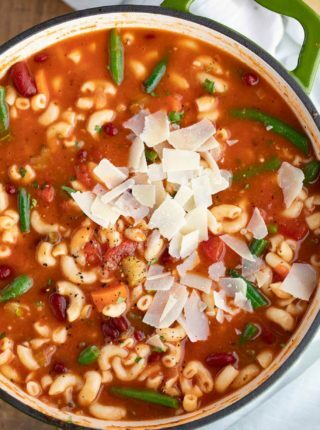 This is hands down my favorite soup for chilly winter months! It’s absolutely amazing! 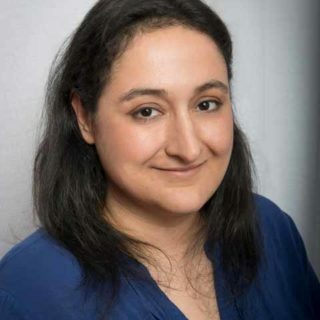 Thanks, Anna! So glad you enjoy it! One of my most favorite soups ever! I have to try yours! This is my absolute favorite soups and the only time I make an exception and eat beef broth (shhh don’t tell!)! It is just TOOOOOOO good! Thank you! Oh wow! Those flavors are simply amazing and it’s so tasty and flavorful, need to make this! I made this last night and it has become a family favorite! I never knew it was so easy to make this classic at home. Thank you! So glad you enjoyed it, Jacque! After making French onion soup in a French owned international hotel, the soup contained the following: onions (julienned) salt, white pepper, and stock (Faucet Stock… Yes, WATER!) For service, we added a stale French bread slice (crouton) and some shredded swiss cheese… under the broiler for 30 seconds. Magnifique! This soup looks fabulous! Exactly what I need – an easy French recipe for Valentine’s Day! This recipe must have come to you directly from heaven…it’s AH-MAZ-ING!!! Love getting your recipes. I share them with my daughters and have tried quite a few of them. I have a few questions. How large do you envision a yellow onion being when you say one yellow onion? Your pictures of stews show a lot of potatoes and carrots floating in the gravy. How do you get so many pieces of potatoes and 2 inch pieces of carrots when the recipe says 2 carrots and 2 potatoes? Why do you specify Yukon Potatoes for use in stews? I’m so glad you are loving the recipes! I would estimate a yellow onion to be roughly about the size of your fist. 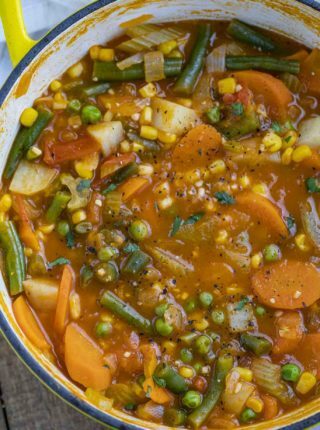 You can always add more veggies if you feel like you don’t have enough in the pot. Maybe my vegetables are larger than yours to start before cutting so I’ll get more from them once cut?? I just love the texture (they hold up better) and flavor that Yukon potatoes give so that’s why I use them more. Hope all of this helps! in your tips you encourage patience in caramelizing the onions and I agree it adds tons of flavor.. Yet in the first step of the recipe you say to cook the onions until see through but not at all browned.. Sorry but I’m confused over what is seemingly a discrepancy.. Please advise. I’m anxious to try this. I’ve edited to read correctly now, thanks for catching that! You’ll want to cook the onions until they are translucent. So sorry for the confusion, that part shouldn’t have been added. You’ll want to cook them until translucent. Thanks for catching that!